The properties of matter at extreme length scales and the respective processes can differ markedly from the properties and processes at length scales directly accessible to human observation. This scale-dependent behaviour is possible in both directions; towards very large and very small scales. Scientists explore the frontiers of these extreme length scales in an effort to gain insight into yet unknown properties and processes. While the exploration of larger scales has been established since the Renaissance era, a comprehensive investigation of small scales was impeded by the limitations of optical microscopy. These limitations were overcome in the 20th century. Since then, a continuous series of developments in analytical power has taken place. Today these developments allow studies of properties and processes even at the molecular or atomic scale (often referred to as nanoscience). These modem nanoscientific possibilities have triggered new innovative projects in geosciences, providing fascinating insights into small scales. Therefore, nanogeoscience has become a very important geoscientific subdiscipline. It was the aim of the 9th EMU school: Nanoscopic Approaches in Earth and Planetary Sciences held from 12-17th August 2007 in Munich to bring together postgraduate students with geologists, geochemists, physicists and chemists, who are experts in both developing and applying a wide range of nano-scale techniques. The lectures covered important analytical techniques ranging from atomic force microscopy, nanoscale secondary ion-beam mass spectroscopy, transmission electron microscopy, electron energy-loss spectroscopy, to the most recent development in nano-scale resolution in synchrotron radiation. Thus, the school provided a thorough introduction to nanoscale techniques and to some of the most important results and developments in Earth and Planetary Sciences. 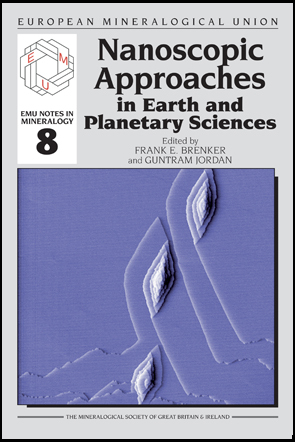 This volume of the EMU Notes in Mineralogy is a compilation of the contributions given by the lecturers at the 9th EMU school. The lecturers have provided eight chapters which give examples of the important research topics and which review the most recent developments in nanoscience within a geoscience context. The editors express their gratitude to the lecturers at the EMU school, to the authors in this volume and to Kevin Murphy for his editorial work. Neither the EMU school nor this volume would have been possible without the many people and organizations who provided valuable help and contributions. Therefore we acknowledge the support provided by the universities of Munich and Frankfurt. In particular we thank the school assistants Andreas Gotz, Katrin Otte and Christoph Schlueter. Financial contributions by the European Mineralogical Union, Deutsche Mineralogische Gesellschaft, Deutsche Gesellschaft fur Kristallographie, IPK Instruments and VolkswagenStiftung are also acknowledged. The main contributor to the school, to whom we are deeply indebted, was the VolkswagenStiftung.